Mentioned by Boyce (1995) for Cyprus (Lapithos) but this has not been repeated in a later publication (Boyce 2006). The occurrence of the species has been confirmed recently. 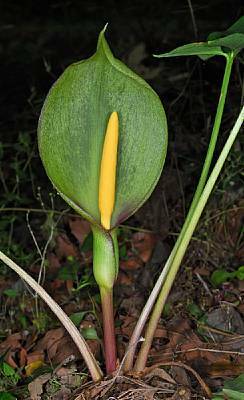 Boyce, P. 1995 ("1994"): The genus Arum (Araceae) in Greece and Cyprus. - Ann. Mus. Goulandris 9: 27-38. Boyce, P. C. 2006: Arum - A decade of change. - Aroideana 29: 132-137. Tuber horizontal. Petiole of leaves 25-45 cm or more, green. Lamina broadly hastate-sagittate, c. 23 x 20 cm, deep green, sometimes with scattered paler spots, acute, with large spreading lateral lobes and distinct, narrow, paler veins. Scape 11-15 cm, much shorter than petioles. Spathe 15-30 x 5-10 cm, greenish-white inside. Spadix 9-17 cm, c. 0.5 x spathe. Female zone c. 18-25 mm; lower sterile zone 2-2.5 mm; male zone 5-6 x 6.5-10 mm; upper sterile zone 6-8.5 mm. Sterile filaments yellowish-white, lower 6-7 mm, upper c. 6 mm. Appendix distinctly stipitate, 7-12.5 cm, with distinct stipe abruptly broadening into club; club ± massive, usually somewhat conical, ellipsoid, 3.5-10.5 cm x 6-13 mm, greenish yellow or dark brownish, ± densely covered with white verruculae. Source: Davis P. H. (ed.) 1984: Flora of Turkey and the East Aegean Islands 8. - Edinburgh.